Will the Easter Bunny be making a stop at your house this weekend? Here are some tips for keeping your pets safe amid baskets full of candy and springtime treats. Candy toxicity and other seasonal poisonings spike in veterinary hospitals around Easter. Some items which are perfectly safe for human consumption are highly toxic for pets. Protect your pets by avoiding these 5 common holiday goodies and click on the links to get more in-depth information on each subject. In small amounts, chocolate can cause vomiting and diarrhea, but in large amounts, it can be potentially fatal. Keep baskets out of pets’ reach and avoid feeding this sweet treat to your pets. Substitute their favorite doggy or kitty treat or a piece of sweet apple to keep them occupied. Xylitol is a common ingredient in sugar-free gum, mints, candy, and now even sugar-free peanut butters. It is very poisonous to pets. Even one or two sticks of xylitol-containing gum can cause liver damage, seizures or worse. Both raisins and grapes can cause kidney failure in pets. Offer your dog a baby carrot as a treat instead. Although beautiful to have around the house during the spring season, keep cats and dogs away from this toxic plant. 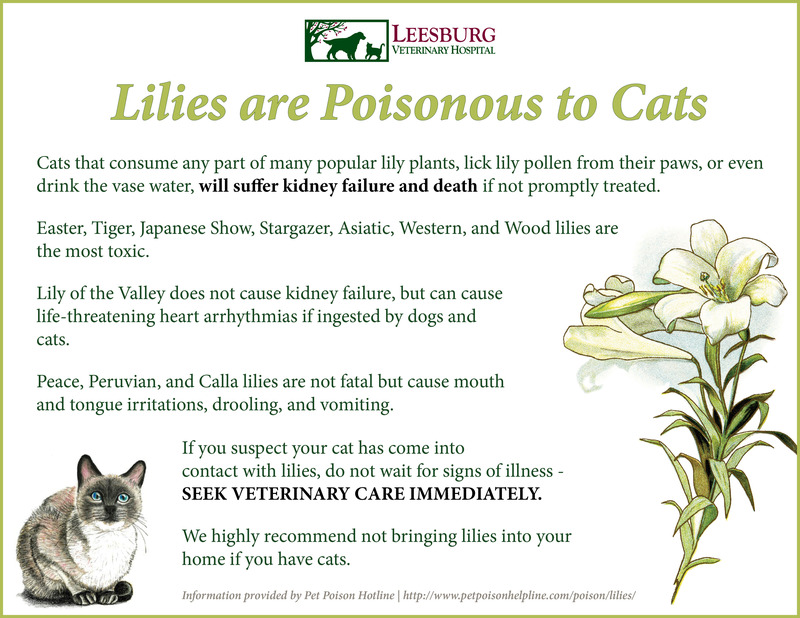 Cats that consume any part of many popular lily plants, lick lily pollen from their paws, or even drink vase water, will suffer kidney failure and death if not promptly treated. If you suspect your cat has come into contact with lilies, do not wait for signs of illness – seek veterinary care immediately! We highly recommend not bringing lilies into your home if you have cats. Make sure your pets don’t raid the Easter basket when nobody is looking! These synthetic materials can cause vomiting, diarrhea and even more serious intestinal obstructions. Keep them far out of reach and give your pet a chew toy stuffed with food such as a Kong toy to keep their attention while you enjoy your Easter basket goodies. We also recommend downloading the ASPCA’s Animal Poison Control Center’s app. This handy app outlines toxic foods, plants, and household products, organized by species. For more information and to download the app, click here.